If you run into issues while using your WordPress app, we encourage you to visit the forums for troubleshooting help and to view other discussions that might be helpful. You can also provide feedback and requests for features, and weigh in on future development. For iOS users, visit the WordPress for iOS Forums. For Android users, visit the WordPress for Android Forums. Here are some frequently asked questions. Jump straight to FAQs for iOS, Android, Desktop app, and Lightroom Plugin. How do I connect my site? What if I don’t have a site, or don’t remember my password? How can I manage my site? How do I make a new Post? How do I make a new Page? Can I make my text fancy? How can I add an image? How do I edit image meta data? Where are the rest of the post options? Which version of WordPress does the App work with? Which devices will this work with? I get an “Unable to read the WordPress site on that URL” error message. What do I do ? I get a “Blog returned invalid data” error message. what do I do? I can’t login, I get a “Precondition Failed” or a “Forbidden” error message. What do I need to do? I can’t upload photos/videos, I get a “Failed” error message. What do I need to do? My blog is located in a folder, and resolves to http://example.com/blog. How do I add the blog? Can I adjust the size of photos uploaded from the app? 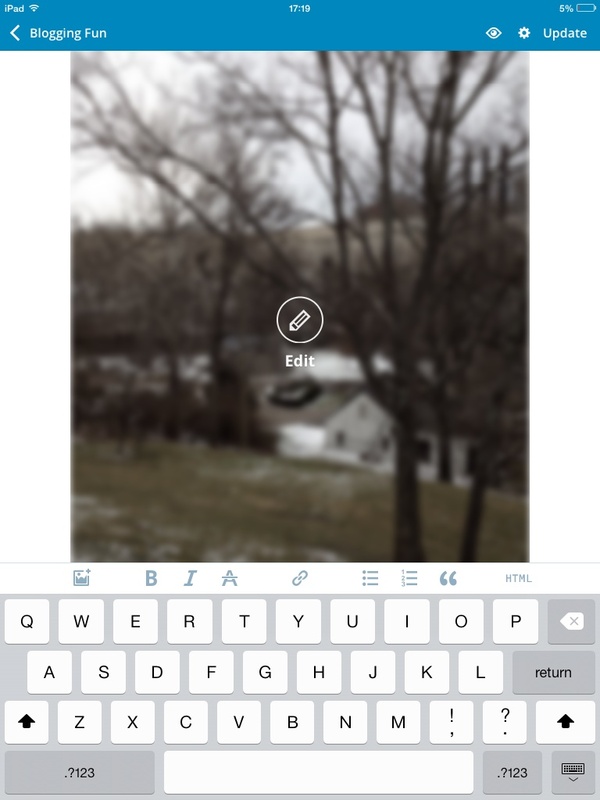 I can save posts to local drafts but can’t figure out how to publish to the blog — what do I need to do? How do I delete a blog? I get an “XML-RPC Service are disabled on your blog”. How I can enable them on my blog? My Host Blocks XML-RPC Access! How do I fix that? Can I use SSL to encrypt the App communication? I’m in China and I can’t login, I get an SSL error. What do I need to do? How to set up Stats via Jetpack? I can’t connect to my self-hosted site, what do I do? How do I send in debug logs from the app? Which Android devices will this work with? How do I enable XML-RPC access to my site? Can’t add my site to the app. What do I do? Can I reduce mobile data usage when uploading pictures from the app? Can I use stats with a self-hosted site? Adding a site is taking a long time or times out. How do I fix that? Why do I get a “connection refused” error when on the stats tab? What is the WordPress.com Desktop app? Can I use it to edit my self-hosted WordPress website, or is it only for WordPress.com? How do I install this app? Mac OS X: Can I turn off the dock notification badge? I would like to report a bug. Where can I do that? Is the WordPress.com Desktop app open source? How do I uninstall the app? That answers all my questions! What’s next? How do I install the Lightroom plugin? How do I export to my site? Can I use it on my self-hosted WordPress website? What is the WordPress.com Add-on for Google Docs? How do I install the Google Docs Add-on? How do I publish my draft? How do I uninstall the add-on? How can I choose which Google account the add-on gets added to? To access a site hosted with WordPress.com, log in with your WordPress.com credentials. To access a blog that is self-hosted, select “Add Self-Hosted Site,” then enter the username, password, and URL associated with that blog. (If your blog uses the Jetpack plugin, you can log in on the main screen with the WordPress.com username and password you used to set up Jetpack.) You can add additional blogs to your app at any time by selecting the “My Sites” icon and tapping the “+” icon in the top right. Each of these blogs can be managed independently through the app. You can recover your WordPress.com password using the link just below the “Sign In” button, or register a new WordPress.com account by using the “Create Account” link at the bottom of the screen. If you don’t see the links, try hiding your keyboard. In addition to access to your blog, you will see the WordPress.com Reader through the app. Your Reader displays all the posts from all the blogs you follow in the order they were published, with the most recent posts appearing at the top. You’ll see an excerpt and featured images from each one, and can tap to read the full post. You can also add blogs to your Reader, search and sort by tags, and much more! Select the icon in the bottom navigation bar to manage your Reader. Select the “My Sites” icon, and choose the site you are ready to manage to open your iOS Dashboard for that site. From here you can add or edit blog posts, pages, and comments. You also have Admin access for any sites where you are an Admin, and can view stats (for Jetpack and WordPress.com sites), edit general site settings, or access the Admin panel in a browser window. You can post at any time by selecting the icon in the bottom navigation bar. This will create a post on the last selected site; change which site you’re publishing to by selecting a site from the drop-down menu in top navigation bar. You can also create a post by selecting “Blog Posts” from your site’s iOS Dashboard, then tapping “+” icon in the upper right corner. Edit any post by selecting it from the “Blog Posts” screen. You can create a page by selecting “Pages” from your site’s iOS Dashboard, then tapping the “+” icon in the upper right corner. You can edit any page by selecting it from the “Pages” screen. While creating a post or page, you can add rich text inline using the buttons just above the keyboard. The default styles include bold, italics, strikethrough, hyperlink, unordered and ordered list, and blockquote. You can also toggle to the raw HTML if you’d like to add more robust styles in the code. To add an image, tap the icon just above the keyboard. The app may ask you whether you want to allow it to have access to your photos — click “OK”. You can upload images or video, or add media from your site’s media library. Once an image has fully uploaded, tap the image to bring up the “edit” overlay. Tap the image again to bring up the image details. You can edit the image’s title, caption, alt text, alignment, like, or size. We make sure the app works with the current and two previous versions of WordPress. Earlier versions are not supported, but most features may still work. The app works with any device that is running iOS version 10 or greater. When I try to add a self-hosted site, I get an “Unable to read the WordPress site on that URL” error message. What do I do? Ensure that you’ve typed in the URL correctly. If it’s correct, make sure XML-RPC services are enabled on the site. Next, follow the link, http://example.com/xmlrpc.php?rsd, and make sure it resolved to an XML file. Locate the WordPress API item: http://example.com/xmlrpc.php. Go to the W3C Markup Validator and type in the URL of your WordPress site. If you get a response such as “… one or more bytes that I cannot interpret as UTF-8,” that is most likely what is causing the app to have trouble with your site. Switch your site to the default theme, deactivate any plugins, and try again, to help pin down where the problem is. If everything works, enable your theme and try again. If everything still works, reactivate each plugin one at a time reconnecting each time, until you find the one that is causing the breakage. Turn on the Debug Mode to enable the extended log format, and check the log file. A common issue that can cause errors is invalid characters. The easiest way to check is to go to the W3C Markup Validator and type in the URL of your WordPress site. If you get a response like “… one or more bytes that I cannot interpret as UTF-8,” that is most likely causing the app to have trouble with your site. I get a “Precondition Failed” or “Forbidden” error message when I try to log in. What do I need to do? If you receive a “Precondition Failed” that is most likely a mod_Security issue discussed in this WordPress Support Forum discussion.Check with your hosting provider or system administrator to see if permissions or other issues are causing the error. I can’t upload photos/videos — I get a “Failed” error message. What do I need to do? Type in the full URL when adding the blog, in this case, example.com/blog. You can choose whether to have photos resized for faster uploading and to save space on your site. On the “Me” screen, tap “App Settings” and adjust the “Max Image Upload Size” slider to set the maximum height and width for uploaded photos. For WordPress.com sites, tap “Edit” in top left of the screen and use the toggle switch on the right to show or hide the site. For self-hosted sites, select the site and go to “Settings.” Select “Remove Site” to remove the site from the app. Note: As of WordPress 3.5, XML-RPC is enabled by default. The following settings only apply to 3.4 or lower. Go to your blog and log in (/wp-admin). In the sidebar, open Settings and then select Writing. Under Remote Publishing, check the XML-RPC protocol checkbox. Rename your xmlrpc.php file to something different, but only change it after the ‘xmlrpc’. Ex: xmlrpc_wp.php. Read the installation instructions and activate the plugin. Remove your blog from the app and re-add. Yes. On WordPress.com sites, all communication (done over XML-RPC) is by default going to use an encrypted connection via SSL. For self-hosted WordPress sites with SSL enabled, WordPress 2.6.1 or later supports pointing the RSD information at the “https” version of xmlrpc.php, which creates an encrypted communication link with the app. I’m in China and I can’t log in — I get an SSL error. What do I need to do? Tap the “Add Sites” button. How do I set up Stats via Jetpack? Connect the plugin to a WordPress.com account. In the Jetpack tab in your dashboard, click the “Connect to WordPress.com” button and follow the directions. In the app, enter the credentials to the WordPress.com account connected to the Jetpack plugin. You can do this when prompted on the site’s Stats screen, or by logging in to that WordPress.com account in the app. I can’t connect to my self-hosted site. What do I do? If this guide to help you make the XMLRPC endpoint accessible didn’t help, you may be running a plugin that is blocking access.We have a running list of WordPress plugins that can break your site here: http://ios.forums.wordpress.org/topic/app-blocking-plugin-list?replies=1#post-5985. If you’re running any of these plugins, please disable them to see if that fixes the problem. If your plugin is not on the list but does make your site unreachable, please let us know and we’ll add it. Feel free to nudge the developers of the respective plugins to fix the connectivity issues! You doesn’t have sufficient privileges for that site. Your user role needs to be Author, Editor, or Administrator to be able to manage content in the app. You recently changed the URL associated with your site in the app, moved your website elsewhere, or changed your CMS. Solution: make sure you have the sufficient privileges on the site, Author or higher. Make sure the site URL in the app is correct by going to Settings and tap your site to edit it. Tap the “Me” icon in the bottom navigation bar. Exit the app, re-open it, and try to perform the actions causing difficulty. Go back to the Help & Support screen. Email the logs to the recipient of your choice. To access a site that is self-hosted, tap the “Add self-hosted site” link, then enter the username, password, and URL associated with that site. If your site is connected to Jetpack, you will also need to provide your WordPress.com login information to receive your Stats information. Add additional sites to your app at any point by selecting the icon, selecting “Switch Site,” and tapping the “+” icon in the top right. Each of these sites can be managed independently through the app. 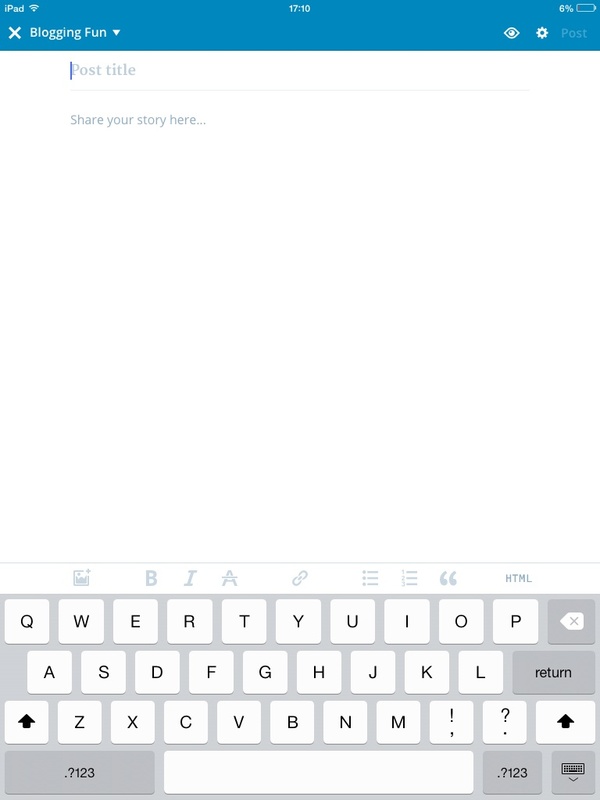 In addition to access to your blog, you will see the WordPress.com Reader through the app. Your Reader displays all the posts from all the blogs you follow in the order they were published, with the most recent posts appearing at the top. You’ll see an excerpt and featured images from each one, and can tap to read the full post. You can access the Reader by selecting the icon. You can also add blogs to your Reader, search and sort by tags, and much more! Select the icon in the upper-right corner to manage your Reader. To manage your site, tap the icon to display the Android Dashboard, where you can choose the site you are ready to manage at the top of the menu. To switch sites, click the site title displayed at the top of the list. You can add or edit posts, pages, media and comments. You can also update themes, add an image or video, view stats, or go view your site in a browser. You may need to scroll down to see all of the options. Once you tap the icon and select your site, select “Blog Posts” in the Android Dashboard, then tap the icon in the bottom-right corner. You can edit any post by selecting it from the “Blog Posts” screen. Once you tap the icon and select your site, select “Pages” in the Android Dashboard, then tap the icon in the bottom-right corner. You can edit any page by selecting it from the “Pages” screen. While working in a post or page, you can do basic text editing. Tap the icons located directly above the keyboard to add styling like bold, italics, underline, strikethrough, hyperlink, blockquotes, and the ‹more/› tag. You can add images directly from your device, or from your site’s media library. From a post or page, tap the icon. You’ll have several options, including uploading from the device, choosing existing media, and even creating a new gallery! The “Capture” feature activates your device’s camera, while “Select … from gallery” allows you to choose media already stored on your device. You can also select existing media from your site’s media library or create a gallery of existing media. The app works with WordPress.com and WordPress 3.6 or higher. The app will work on all phones running Android version 4.1 (Jelly Bean) or higher. Note: As of WordPress 3.5, you no longer need to enable XML-RPC access. While logged into your WordPress dashboard, select “Writing” under the “Settings” tab on the left. Scroll down to “Remote Publishing,” then check the box next to XML-RPC’ and save your changes. I can’t add my site to the app. What do I do? If it’s correct, make sure XML-RPC services are enabled on the blog. Go to the W3C Markup Validator and type in the URL of your WordPress site. If you get a response like “… one or more bytes that I cannot interpret as UTF-8,” that is most likely what is causing the app to have trouble with your site. Turn on Debug Mode to enable the extended log format, and check the log file. Rename your xmlrpc.php file to something different, but only change the part after the ‘xmlrpc’. E.g. : xmlrpc_wp.php. Read the installation instructions and activate the plugin . Remove your site from the app and re-add it. 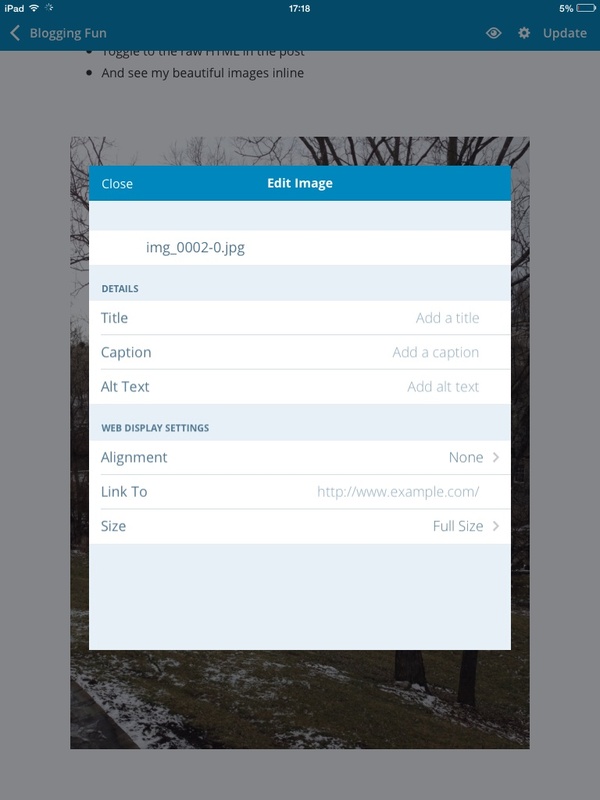 From your site’s dashboard in the app, select “Settings,” then enable the “Optimize Images” setting. When this setting is ON, and you’re on a mobile data connection, pictures will be resized to 3000px wide before uploading. Can I view stats from a self-hosted site? Yes! If you install Jetpack, you can enable stats for your self-hosted site. After installing the plugin, tap the “Stats” button in the app and enter your new WordPress.com login when prompted. Adding a site is dependent on the speed of your Internet connection, so if you have a very weak signal or a slow EDGE connection, try again when you are in 3G/4G or Wi-Fi mode. If you’ve installed an ad blocker app such as AdFree Android, it will block your connection to stats.wordpress.com. You will need to edit the /system/etc/hosts file on your device and remove all entries that have stats.wordpress.com to get it working again. The WordPress.com desktop app puts WordPress.com in your dock or taskbar. Use it to focus on your content and design with no other browser tabs to distract you, or to keep your sites readily accessible. The app is powered by the same technology that runs WordPress.com. To edit your self-hosted WordPress (.org) website, you need to install the Jetpack plugin, which you can do with these instructions. Once Jetpack is installed and connected to a WordPress.com account, make sure the Jetpack Manage module is enabled. Now you can sign in to the app using the WordPress.com account Jetpack is connected to, and you can find your self-hosted site under the “My Sites” section. Download the app from the homepage. Open the downloaded DMG file. You will see a WordPress.com icon, and an Applications folder shortcut on the right. Drag the WordPress.com icon into the Applications folder. Open the Applications folder, and open the WordPress app. If you’d like to keep the app in your dock, right-click the app icon in the dock as the app is running, and select Options → Keep in Dock. Download the app installer from the homepage. Open the installer, and follow the instructions. Once the app is installed, you can double-click the app icon on your desktop. If you’d like your app to be in your taskbar, you can drag the icon from the desktop to your taskbar. Download the app for your flavor of Linux on the homepage. Open the downloaded file, and follow the instructions. Yes. Open the app, and then open the WordPress.com → Preferences in the application menu on your desktop. Now you can uncheck Show notification badge. The best place to report a bug is the GitHub issues tracker for the WordPress Desktop project, but before you report a bug there, we kindly ask that you make sure the bug is specific to the app and not the WordPress.com website itself. If it’s a bug on the WordPress.com website, please report it in the GitHub issues tracker for that. Is the WordPress.com app open source? Yes. The WordPress desktop app is licensed under GNU General Public License v2 (or later). On Mac OS X, you can uninstall by moving WordPress.com app from Applications to the Trash. To remove all settings you can use this WordPress.com Uninstall script for Mac. From Lightroom, open the plugin manager (File menu, then Plugin manager). Click add in the bottom left corner of the plugin manager . Navigate to where the plugin was unzipped and select the plugin. The plugin is now installed. Select your photos in Lightroom. Click the export button . Ensure that WordPress.com is selected from the export dialog. Ensure your site has been connected (see below). Ensure your site is selected from the dropdown list. The first time you use the plugin (see ‘how do I export to my site,’ above) you will need to authorize the connection to your account. Approve the connection in your browser. You will be taken back to Lightroom once approved. To upload to your self-hosted WordPress (.org) website, you need to install the Jetpack plugin, which you can do by following the instructions here. Compose a document in Google Docs and send it directly to any WordPress.com or Jetpack powered WordPress.org site as a draft post. Instead of copying and pasting from Google Docs to WordPress and losing your images and formatting in the process, this add-on makes it easy to compose in Google Docs and publish to WordPress with formatting intact and images uploaded properly. After installing the add-on, you’ll be able to open WordPress.com for Google Docs in any Google Doc and connect your sites. Can I use the add-on to edit my self-hosted WordPress website, or is it only for WordPress.com? To edit your self-hosted WordPress (.org) website, you need to install the Jetpack plugin, which you can do by following the instructions here. Go to the add-on page in Google’s webstore. Click the blue + button to add it to your account. The sidebar will open, and you can click the “Authorize” button to begin adding sites. To publish a draft, make sure that you have clicked the “Save Draft” button. A preview link will show up under the button. Click that link to preview the post on your site. Once you have verified that the post is displayed correctly in your theme, click the “Edit” link on your site to go to the WordPress editor. There, you will be able to add categories, tags, and publish. In the upper-right corner, make sure that you have the correct account selected. Open an existing document or create a new one. Make sure you are running the latest version of the Jetpack plugin. Temporarily disable all plugins except for Jetpack and try again. If that works you can re-enable the plugins once you are connected. If you are using Cloudflare, try temporarily disabling it while you connect your site. Once your site is connected to the add-on, you can re-enable it. If your site uses HTTPS, your hosting company may be “double-encoding” some of the values being passed. To test this, go to http://your-site/?%40 (change your-site to the URL of your WordPress.org site). If your browser changes the URL to https://your-site/?%2540 (note that ?%40 changed to ?%2540) you need to contact your hosting company. If you are still having issues, please visit Jetpack Support.